Fryer oil plays a very important role in the kitchen. Even with the best ingredients in the world, if the frying oil isn’t up to par, the food may not reach its full potential. There are many reasons why cooking oil may not be making the grade, but the good news is that many of these are easily managed. Multiple factors impact the performance of cooking oil, including the types of food being fried, the amount being fried and the duration of filtration activities, to name a few. Food is a large variable in cooking oil performance since each type impacts how long oil can last and how fast it breaks down (otherwise known as durability, or fry life). Proteins such as chicken or fish, for example, are harsher on oil than starches, such as potatoes, due to the protein’s breading and seasoning that inevitably gets into the oil. Another variable that impacts cooking oil is consistent filtration. If the oil isn’t being properly cared for, it can impact quality and flavor of the oil and in turn, the quality and flavor of the foods being fried. And, if filtration activities aren’t being routinely completed, you’re likely to spend excess money on oil because of premature disposal and replacement of entire vats of cooking oil that, with proper filtration, could have lasted longer. Well-managed, properly filtered oil, in conjunction with regularly maintained equipment, helps reduce kitchen costs and waste while increasing operational efficiencies and productivity. Well-trained staff and quality automated equipment put directors at an advantage when it comes to frying the foods their customers love. Follow these steps to extend the life of fryer oil and achieve optimal frying results. For every day that oil is managed with consistent filtration, it gains two days in functional oil life. The life of the oil depends on the type of oil, the quality of filtered oil and the kind of food being fried, as well as the frequency with which the fryer is used. For example, medium-durability oil, such as premium soy, can generally be used for at least seven to 10 days if the oil is properly managed and filtered. Make sure you’re getting the most out of the oil without sacrificing quality—every unnecessary disposal is money down the drain. Well-maintained, quality equipment and standard procedures can make all the difference when it comes to extending the life of fryer oil. But the reality is, no matter how well your fryer is working or how effective employees are at properly filtering and managing fryer oil, manual oil maintenance can be a dirty, hazardous job. That’s why automated oil management systems exist for use in conjunction with existing fryers. Automated oil management systems take the hassle out of changing and filtering oil, resulting in safer and more sustainable and efficient oil management. These systems handle the mess and danger of oil management so employees never have to touch a drop. And unlike other services, these systems often include tech features such as a dashboard for easy-to-understand performance indicators, UCO sustainability metrics and monitoring systems, enabling directors to track daily usage and disposal patterns and receive alerts. 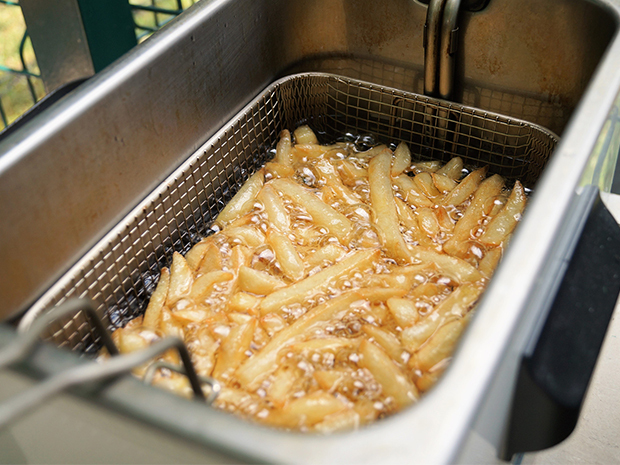 Using an oil management system can help set up your facility for long-term success by properly tracking, filtering, disposing of and maintaining your fryer oil.